Summary (from Goodreads): Dex Pratt is seventeen years old, a star basketball player and a budding filmmaker. And his life has been turned upside down. His parents have split up and his mother has remarried and taken him to a new life in the city. When his father attempts suicide and fails, Dex returns to their small town to care for him. He is not, however, prepared for how much everything has changed. Gone is the suburban split-level on the outskirts of town. Gone are the new cars, fancy bikes and other toys. Now he and his wheelchair-bound dad live in a rotting rented house at the back of a cornfield. And, worse, his father has given up defending marijuana growers in his law practice and has become one himself. 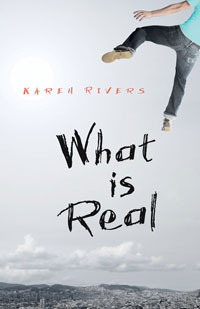 What Is Real presents a poignant portrait of suburban family life gone south. Dex Pratt is smart, funny, creative and compulsive; he's also angry and disillusioned. But most of all he's a character that readers won't soon forget. My Summary: Dexter Pratt used to have a great life. His loving parents would buy him anything he wanted, he was popular, and he had a band and a camera and actually lived in the same house as the rest of his family. But then, all of a sudden, everything changes. Dex's mom moves out, divorces his dad, and gets married to some politician guy she met online. His dad - so distraught by being abandoned by his wife - attempts suicide. Because of this, Dex is forced to leave his posh new life (private school, new car, popular stepbrother) to return home and take care of his dad. But his dad is different now - instead of defending marijuana growers in his law practice, he has become one, supplying the entire town and Dex as well. Dex is so depressed by his current situation that he does the only thing he thinks he can do - smoke himself into a state or surrealism, where he has no idea what is real. My Thoughts: If you've ever seen the movies Shutter Island or Inception, you'll know what I mean when I say What Is Real is a book that effectively messes with your head (in a good way). Our main character Dex is always so hopped up on his dad's 'stuff' that he hardly knows the difference between what he's imagining (he has quite the active imagination, trust me) and what is real. The reader sees Dex's world through his own point of view, meaning you - like Dex - have no differentiation between reality and imagination. Add to that the fact that there are crop circles popping up in the cornfield next door and the new girl at school is exactly what Dex has always wanted (down to the four freckles on her left cheek), and you'll begin to see Dex's downward spiral taking place. Despite the controversial behaviour of the main character, I really liked this one! It really worked your mind and confused you at times (purposely and in a good way) so that you, like Dex, had no idea if he was actually experiencing certain things or just imagining everything while sitting in the cornfield smoking. Dex is one of those characters that has lost his way, and throughout the book you begin to wish that someone cared enough to help him out. Tanis was also a great character, and I'm sure everyone has met and 'Old Joe' in their lifetimes (creepy, perverted old man, anyone?). The writing was great - smooth and clear - and I really liked the addition of the 'camera scenes' at the beginning of the chapters. Final Thoughts: I recommend this novel to anyone looking for a funny / sad contemporary lit book, and anyone who likes having their mind messed with a little. Because of the topic, I think this should be kept to readers 16 and up (or those who are mature enough to handle it). Can't wait for more from the author! This sounds like a crazy good read! Excellent review. I'm glad you liked this book. I really didn't, but I know it's just because of the kind of book it is, not because of the writing. I didn't like Inception, either. I just need a story that makes sense -- I don't like not understanding things immediately. And that's just me, not the book.